PMP ITTO (Inputs, Tools and Techniques, Outputs): BrainBOK ITTO Explorer tool is an innovative and unique ITTO tool that aims to bring the entire PMBOK Guide to just one screen. Since its launch on Dec 25, 2010, nearly 50,000 PMP and CAPM aspirants around the world have used it to fastrack their certification process. 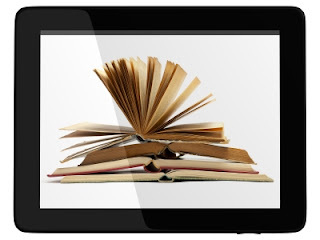 It has received awesome reviews and feedback. However, I’m a firm believer that the biggest room in the world is the room for improvement. As I mentioned in my previous post, recently I realized that even though the ITTO Explorer was great at getting your head around the PMBOK ITTO’s, it was missing a very crucial component of the PMBOK Guide - process interactions and data flows. In this post, I’m going to walk you through some of the enhancements in BrainBOK v6.0 that overcome those limitations and literally bring the PMBOK to one screen. Let’s start with a SWOT analysis of the ITTO Explorer. The ITTO Explorer was built around, well, the ITTOs - Inputs, Tools and Technique, and Outputs. You could select a process and drill into its ITTOs (drill down). Conversely, you could select an ITTO to find the processes that the ITTO was used by (drill up). It also told you “why” a particular process used an ITTO (we call it the ITTO Secrets). But it did not tell you how one process interacted with another, and what data flowed from one process to another. It took me nearly 2 years to realize this weakness. Realizing the weakness was the first step toward improvement. If you want to improve, you would have to change. By trying to do more with the tool, there’s a threat that the tool would become too complicated, and lose it’s simplicity and intuitiveness. So, I had to guard against this threat. After scratching my head for weeks and losing a few hair in the process, I believe I’ve finally got a good solution. The entire data flow has now been mapped into the ITTO Explorer, with absolutely no change in the layout. In fact, the change is so subtle that you may not even notice it. So, let me walk you through the changes and give you some insight. First of all, click on Load Data to populate the data into the grids. Now click on a process name in the top grid. As soon as you click on a process name, the middle grids are updated to show you the ITTOs of the selected process (this is an existing functionality). The bottom grids are updated to show the processes that feed from/into the selected process (this is the new functionality). It is much easier to explain this with an example. 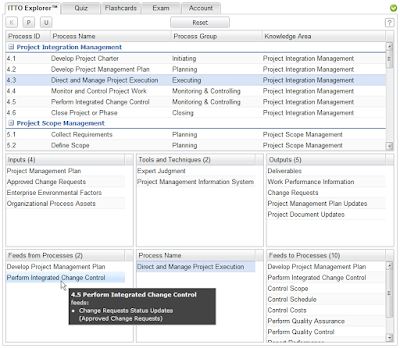 Let’s take the example of the Direct and Manage Project Execution process. 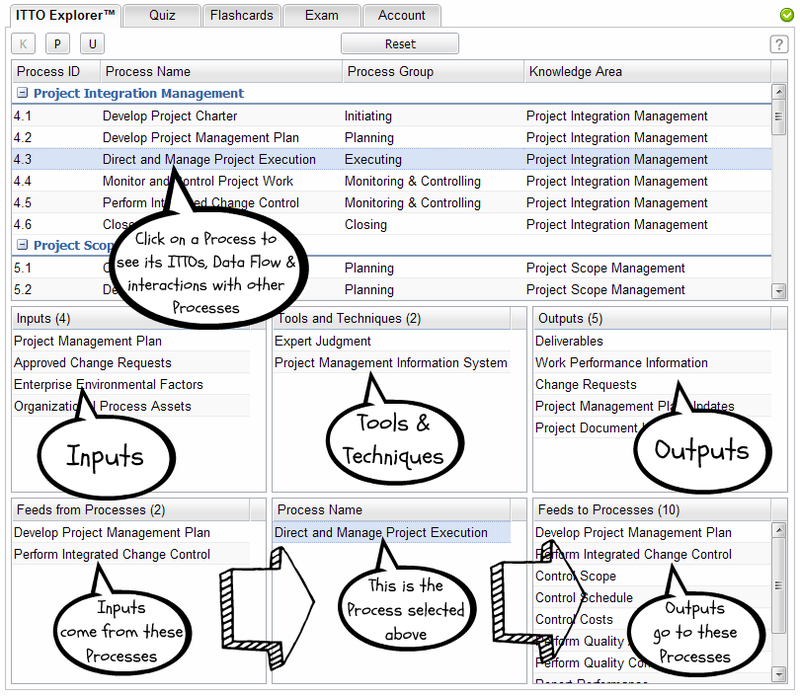 When you click on this process in the top grid, the Feeds from Processes grid (bottom left) will update to show you the processes that provide inputs to Direct and Manage Project Execution. 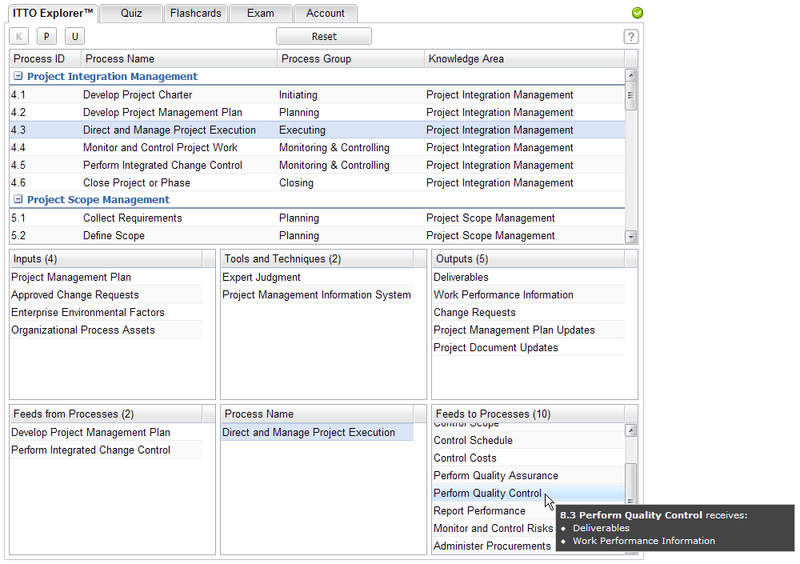 Similarly, the Feeds to Processes grid (bottom right) will update to show you the processes that receive outputs of Direct and Manage Project Execution. 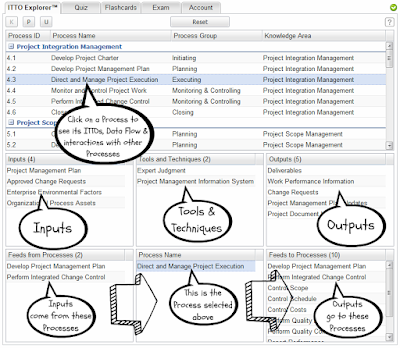 If you refer to the screenshot below, you can see that there are 2 processes that provide inputs to Direct and Management Project Execution, and 10 processes that receive the outputs of Direct and Manage Project Execution. Now the next logical thing is to see what inputs and outputs flow among various processes. Let’s continue with the previous example. 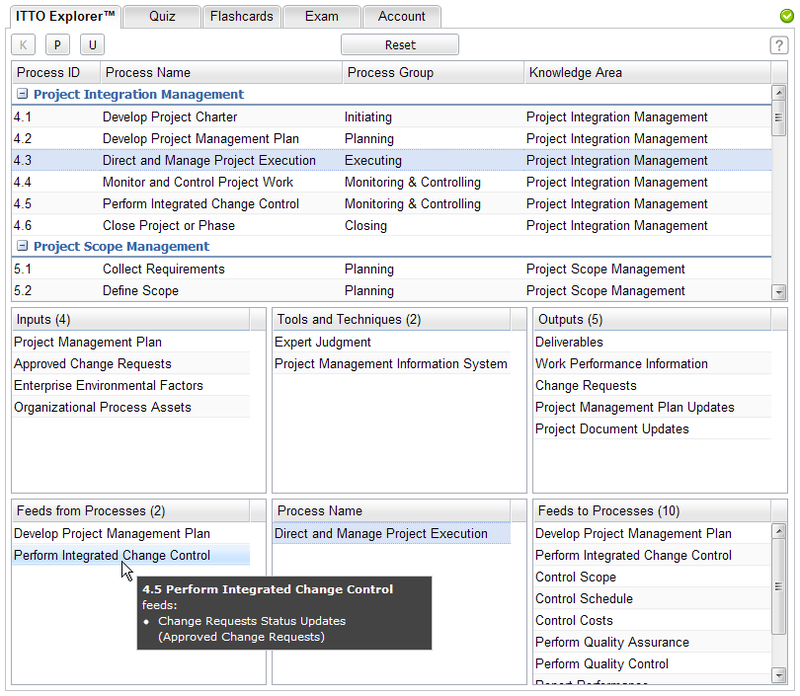 If you hover your mouse cursor on Perform Integrated Change Control in the Feeds from Processes grid (bottom left), you can see that Change Requests Status Updates (Approved Change Requests) flow from Perform Integrated Change Control to Direct and Manage Project Execution. 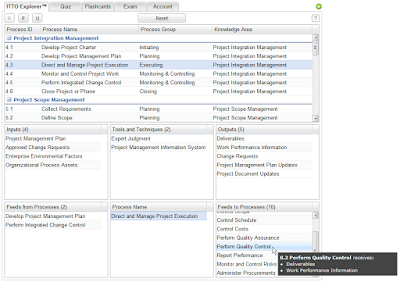 Similarly, if you hover your mouse cursor on Perform Quality Control in the Feeds to Processes grid (bottom right), you can see that Deliverables and Work Performance Information flow from Direct and Manage Project Execution to Perform Quality Control. As you can see, by simply clicking and hovering your mouse cursor on process and ITTO names, you can get your head around the PMBOK Guide very quickly. The secret to adding so much more functionality without changing the layout was overloading the bottom grids. The three grids in the bottom row now serve a dual purpose. If you click on a process in the top grid, the bottom grids show the process interactions and data flows (as described above). But if you click on an ITTO in one of the middle grids, the bottom grids will show the processes that use the selected ITTO (this is existing functionality). By overloading the bottom grid, it became possible to add the new functionality and still retain the simplicity and intuitiveness of the original design. The same 7 grids now allow you to do so much more. In a follow-up post, I’ll walk you through a few other noteworthy enhancements, which were added in version 6. I have a few other ideas for improvement in mind. But I won’t spill the beans just yet. Instead, I want to hear what you think, and get your feedback and suggestions. Please use the comments section below to tell me what you think about the new enhancements and how this tool can be improved further. I read each and every comment posted on this blog, and take all feedback very seriously. The new PMP Exam Result Report will show a 4-level performance rating - Above Target, Target, Below Target, and Needs Improvement - for each domain and task. This looks really promising! As a PMP aspirant (hopefully a full PMP this fall). I would like to get my hands on this one. Thanks Randy. I hope you'll find it useful. Let me know your feedback.